Well, this is kinda late. Sorry. Yes, the Boston Celtics. We all know them. They’re not as championship-hyped this year. But, hey, they proved everyone wrong. After winning against the Heat, the Cavs and the Magic, they’ve made a bold statement to the league and us, the fans. Remember the 2nd-half of the season? They were playing horrid. Finishing 4th in the Eastern Conference standings. Albeit, they still have that experience inside their team. And obviously, the Playoffs is a different scenario now. They’ve woke up and they’re now much more energized than ever before. Now, their against their all-time rival, the Los Angeles Lakers. I brought in my good friend, Lucas Shapiro, who actually is my 1st boss in the NBA blogosphere. Anyway, he’s best-known for his works in Bleacher Report as a Featured Columnist and in Dimemag.com as an Intern. He is also Real Sports Net’s Director of Content in the NBA area. The Q’s are in Orange while L-Shap’ anwsers are in Celtic green. Way before the Playoffs started, Celtics weren’t even in talks being in the NBA Finals. How does it feel seeing your Celtics be back in the limelight after a 1-year absence and proving those analysts and haters wrong? I’m happy for them. I definitely did not see this coming. I thought they were going to be gone in the first round since they were not playing hard at the end of the season. I guess the new trend of taking the second half of the season off has worked for them. This team is completely different from the NBA’s regular season. With your guys getting rejuvenated and all, have you even expected them to wake up? I thought they wouldn’t wake up. I was watching how poorly Paul Pierce and Kevin Garnett were playing and I thought they didn’t have a chance this year. What are Boston’s keys to win these series? Their main problem is rebounding. They are not the tallest team, so their key is to box out. That means everyone too, not just the big man. Everyone needs to crash the boards, force L.A to only take one shot on each possession. If they can do that, they can win the series. When the season started, we saw a different Rajon Rondo. He garnered an All-Star performace in Dallas early in the year. Not only that, he also lead the league in steals; earning him a spot in the All-NBA Defensive team. Now, the Celtics main concern is him being limited. How does this affect the team’s play and how do the Celtics bounce back from this? 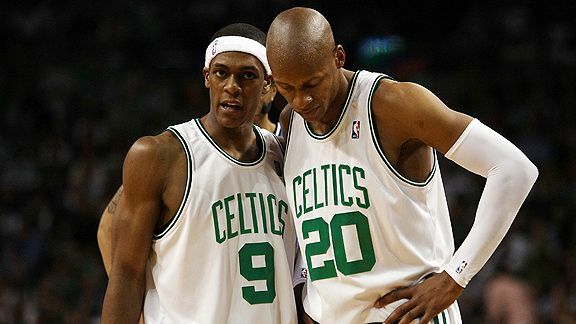 I always knew Rajon Rondo was going to be a great player ever since the beginning of the 2008 season. The lack of a consistent three-point shot can be a problem only if Ray Allen and Paul Pierce are missing shots. We saw Allen and Pierce go 0-6 from the three-pointer in Game 1 and that is one of the reasons why Rondo was less effective. The Celtics are renowned for players, who contribute unexpectedly. Players like Glen Davis (HEAT series), ‘Sheed (CAVS series) and Nate Robinson (MAGIC series) headline the list. 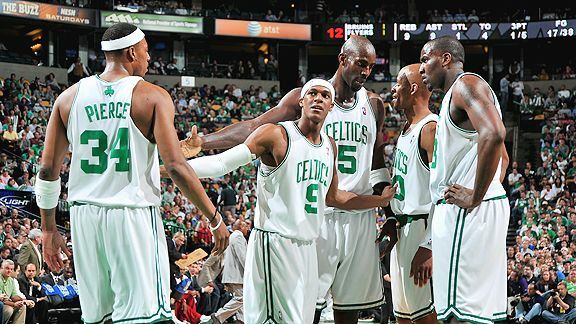 Now, which specific Celtic is gonna breakout and be the X-Factor in the team’s quest for Championship #18? I really think that Tony Allen is the key to the series. It was mentioned on Dimemag.com recently and I completely agree. The Lakers don’t pay attention to the Celtics role players and Allen is the type of guy who can pick up the tempo and expose the Lakers’ lack of speed. I’ve read your article on Bleacher Report about the 2010 NBA Finals. And I saw you picked the Celtics in 6. Why is that? Just to let the readers know. (I actually picked the Celtics in 7) I think the Celtics have better chemistry and toughness. Everyone is talking about how the Lakers became tough. I don’t really believe it. They won one game! Call me biased but I think it takes more than one game to show your true colors. I think that’s about everything, man. Anything else to say? I’d say check my stuff out at Bleacher Report and Dimemag.com (*Click the links).You have a great site Mark and I’ll be sure to check it out. Keep up the great work. Thanks! I really appreciate the time you gave us. Don’t give up on writing, Lucas. You’re bound for ESPN or any supreme Sports network out there in a few years. Comments are much appreciated. Please leave them down low. 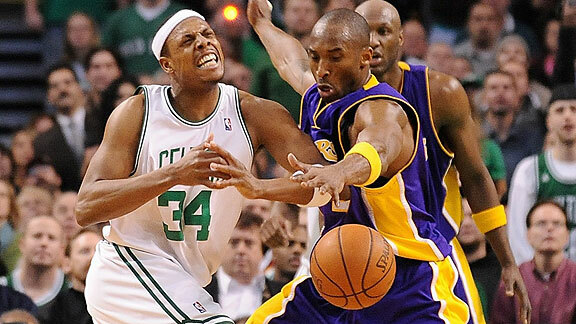 June 2008, the Los Angeles Lakers suffered a tough loss in Game 6 of the NBA Finals to the Boston Celtics. It’s been two years now since that horrid setback happened. And the Lakers have just won their 15th Championship last year. Now, their roster is a lot more different now from 2008. Seeing the departures of Trevor Ariza and Ronny Turiaf. They added the likes of Ron Artest, Shannon Brown and Josh Powell. Not only there roster has changed, their plays form 2008 and 2010 have a lot of differences. The Lakers have utilized their Big Men more. And Kobe Bryant is now a complete player. And when I say ‘complete’, it means he’s now passing and assisting while shooting a great percentage on the floor. They’re rematch is now set with the Boston Celtics on Thursday (9:00PM EST, 6:00PM PST). The Celtics, who have found they’re winning-swagger back, fought through championship-caliber teams. And we even didn’t expect them to be in the NBA Finals back then. It was more like Magic or Cavaliers winning the East. But hey, there’s a saying “Expect the unexpected”. In this Q&A session, I bring in my good friend, Rey Moralde, the lead writer of TheNoLookPass.com and the host of the Chronicles of Crotty Podcast. He’s an LA guy. So obviously, he loves the City of the Angelic. You can follow him on Twitter too. Here’s his Twitter handle, @TheNoLookPass. The Q’s are in orange while Mr. Moralde’s answers are in Laker purple. Now that it’s all said and done, LA is set to meet Boston in the NBA Finals. How does it feel, Rey? After a 1 year absence, the Celtics are back in the NBA Finals. And every baller knows that the Lakers know them pretty well. 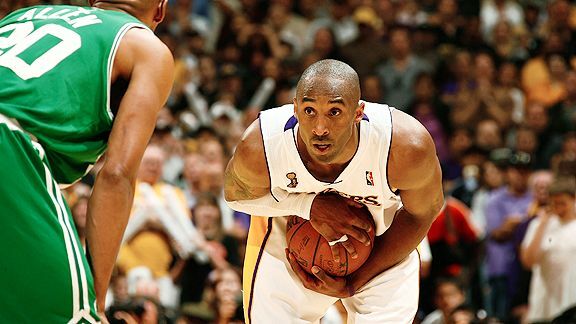 As a Laker fan, what aspect should the Lakers improve in to avoid a similarity of the 2008 NBA Finals? Don’t be afraid to face the Celtics defense. 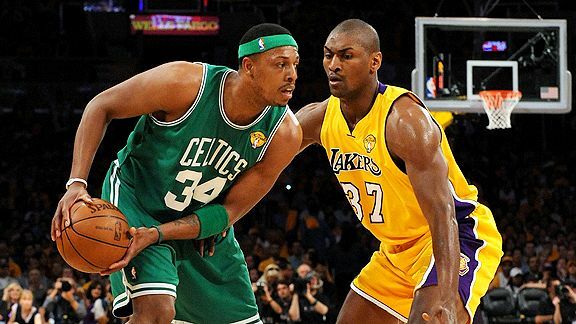 The Celtics defense tends to bully every opponent and the Lakers have done a better job of withstanding them in the regular season games after that embarrassing 2008 series loss. L.A. should be physical back. The frontcourt is key to their success. Pau Gasol doesn’t want to get any more LAME nicknames like “Gasoft”, right? Right. 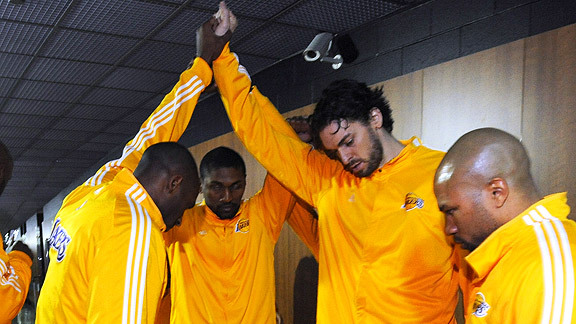 Are you afraid that the Lakers’ bench might go through an icy-slump? And does Andrew Bynum’s inconsistency affect the Lakers’ play? Well, the bench has had its ups and downs. Hopefully, they’ll play a little bit of defense and hit some big shots (remember Sasha Vujacic had 20 points in Game 3 of the 2008 NBA Finals). Bynum’s health is real key to the Lakers winning. He is a big body and is most capable of being physical against the Boston bigs. He didn’t do a good job on rotating on defense in the Phoenix series and that’s mostly because of his bad knee. Hopefully, he can bear it for one last series. Who is the Lakers’ X-Factor? And why? Easy. Lamar Odom. You don’t know what you’re going to get from Lamar Odom. One game, he’ll have an outstanding 17 and 15 game. The next, he’ll suddenly give you only 4 and 4. He HAS to perform big against the Celtics in order for the Lakers to have a chance. Remember that he got huge criticism (along with Gasol) when he didn’t play well overall in the 2008 NBA Finals. Rajon Rondo, who is arguably the best Celtic of 2010, is now playing like a Superstar. Does he scare you? I don’t know anyone that is not frightened by this guy’s ability. And the Laker point guard defense is well-documented. Rondo’s going to run circles all over Derek Fisher, Shannon Brown, and Jordan Farmar. I assume Kobe Bryant is going to get a shot at him as well as Ron Artest. Obviously, the Lakers are well-served to let him be a scorer the same way Lakers tried to do with Steve Nash but everyone should be wary of what Rondo’s playmaking skills can do. The Lakers, who are in their 3rd-straight appearance in the NBA Finals, are seeking a repeat. Is there some kind of pressure for your guys? All of the guys on the roster have won a ring except for Artest. With that said, I’m sure Kobe wants to cement his legacy by beating the Celtics in the NBA Finals. Not only that but he’s seeking his 5th ring. I think it’s more of what Kobe can add to his already hall-of-fame career. And the Lakers have wanted Boston for a while now. I don’t really think there’s any pressure, per se. Can I ask what your final verdict for the NBA Finals or would you like to keep it a secret? Finally, anything else to say? Shoutouts? Your fellow Laker fans? The Celtics’ fans? Who? Just enjoy the series. It’s rare for a Finals rematch to happen in the free agency era. Because I bet 10 years from now… heck, even 5 years from now… we’ll all be clamoring for this series again when these teams are no longer together.